Bahrain National Gas Company’s (Banagas) sales turnover reached $148.28 million in 2017 enabling the company to successfully turn around projected losses into a net profit for the year, says the company’s Chief Executive Dr Sheikh Mohamed Bin Khalifa Al-Khalifa. 'As per market projections, we expect our product prices to moderately improve in 2018. However, that might not be sufficient to counter the many challenges faced by the company in 2018. 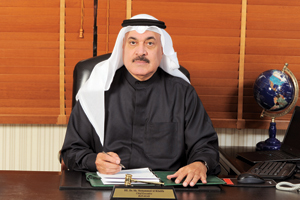 These include an escalation in the price paid for gas and utilities, the need to continue funding the significant capital expenditure needed to modernise our plant facilities and the resources necessary to maintain the company’s excellent record in Safety, Health and Environment,' says Sheikh Mohamed in an exclusive interview with OGN. The biggest challenge for Banagas in 2018 is to successfully complete its expansion project. This involves bringing on line the third gas plant (Train-III), with 350 mmscfd (million standard cubic feet per day) capacity, double that of the current processing capacity, and expansion of its storage facilities together with all necessary supporting facilities. Every effort is and will be made to ensure this project is completed on time and to budget. Upon the project completion, Banagas will significantly increase its contribution to the national economy as well as the employment market by providing more than 100 additional jobs for Bahraini nationals, he says. The engineering, procurement and construction (EPC) contract for CGP-III had been awarded to JGC Corporation in Yokohama, Japan on January 27, 2016 and work commenced on site by mid-May 2016. Through 2017 the majority of equipment was delivered and installed with associated piping, electrical and instrumentation works progressing in parallel. Works are proceeding on schedule to commence pre-commissioning and commissioning activities in 2018 and to achieve first production sometime in the Q4 2018. As of the year-end (2017), 100 per cent of engineering, 98 per cent of procurement and 68 per cent of construction activities have been completed where the overall project progress was 87 per cent, he says. The EPC contract for the Field Pipelines and Sitra Storage Expansion was awarded to JGC Gulf International of Saudi Arabia on October 4, 2016. The contract involves installation of a new pipeline system to transport gas from Tatweer Petroleum’s compressor stations to the CGP-III, a pipeline system to return residue gas to the existing Tatweer reinjection header, tie in to existing pipelines and approximately 21 km long additional butane product pipeline from CGP-III to Sitra. The scope also include modifications to the Sitra Storage facility to accommodate the additional production. This includes installation of two additional storage tanks, one 200,000 bbl for propane and one 100,000 bbl for butane, addition of a new propane compressor train, new flare, fire water pumps, control room, switch room, land reclamation to accommodate the new equipment being installed and associated instrument and electrical works. As of the year-end (2017), 100 per cent of engineering, 98 per cent of procurement and 68 per cent of construction activities have been completed where the overall project progress was 72 per cent against the planned 74 per cent. Commissioning is expected to commence in September 2018 in preparation to receive the product from CGP-III, says Sheikh Mohamed. How were the operational and financial results for Banagas in 2017? Please give the company’s turnover, profits and revenue earned in 2017? The 2017 operational and financial results are moderately much better than 2016. This was mainly attributed to the increase in crude oil prices from $43 (average 2016) to $54 (average 2017) which directly influenced the company’s propane, butane and naphtha prices. However, such increasing gains did not stop the cost saving initiatives started in 2015 and its effects which was felt in 2016 and 2017. The company produced a total of 2.5 million barrels of product, 5 per cent lower than the previous year. In addition we have managed to keep unplanned shutdowns to a minimum while working three million man-hours without a lost time accident. Financially, our sales turnover reached $148.28 million and we were able to successfully turn around projected losses into a net profit for the year. How did Banagas tackle the challenging year of 2017 when oil prices kept falling? And what is your market outlook for 2018? What are the major challenges that you will be facing over the next few years? Crude oil prices averaged $54 in 2017 and as per various reports and analysts it will average $60/bbls in 2018 and $61/bbls in 2019. In January 2018 oil prices briefly hit $70/bbls which was the highest monthly average since 2014. Oil price forecasts depend on the interaction between supply and demand for oil on international markets. Among the most important supply-side factors are the US shale oil production, US crude oil stocks and Opec oil supply. The comforting news is that Opec oil production cuts will be extended to March 2018 which may stabilise crude prices during the year. We at Banagas still think that the market is facing difficulties even with such moderate product price gains. The company responded by reducing capital spending and aggressive cost cutting which will continue without any compromise in development projects which will affect the production and safety of our employees and plant operations. Despite all sluggish market condition, the company will significantly continue its turnaround inspections to minimise the frequency of shutdowns and maintain production at optimum levels. As per market projections, we expect our product prices to moderately improve in 2018. However, that might not be sufficient to counter the many challenges faced by the company in 2018. These include an escalation in the price paid for gas and utilities, the need to continue funding the significant capital expenditure needed to modernise our plant facilities and the resources necessary to maintain the company’s excellent record in Safety, Health and Environment. The biggest challenge for Banagas in 2018 is to successfully complete our expansion project. This involves bringing on line the third gas plant (Train-III), with 350 mmscfd capacity, double that of the current processing capacity, and expansion of our storage facilities together with all necessary supporting facilities. Every effort is and will be made to ensure this project is completed on time and to budget. Upon the project completion, Banagas will significantly increase its contribution to the national economy as well as the employment market by providing more than 100 additional job places for Bahraini nationals. When exactly do you plan to commission Bahrain’s 350 MMSCFD (million standard cubic feet per day) Central Gas Plant III, part of the Banagas expansion project, and Bahrain National Gas Expansion Company’s (BNGEC) $99 million Field Pipelines and Sitra Storage Expansion Project? The engineering, procurement and construction (EPC) contract for CGP-III had been awarded to JGC Corporation in Yokohama, Japan on January 27, 2016 and work commenced on site by mid-May 2016. Through 2017 the majority of equipment was delivered and installed with associated piping, electrical and instrumentation works progressing in parallel. Works are proceeding on schedule to commence pre-commissioning and commissioning activities in 2018 and to achieve first production sometime in the Q4 2018. As of the year-end (2017), 100 per cent of engineering, 98 per cent of procurement and 68 per cent of construction activities have been completed where the overall project progress was 87 per cent. The EPC contract for the Field Pipelines and Sitra Storage Expansion was awarded to JGC Gulf International of Saudi Arabia on October 4, 2016. 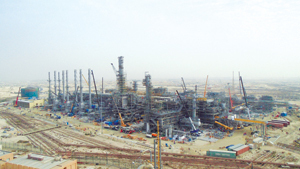 The contract involves installation of a new pipeline system to transport gas from Tatweer Petroleum’s compressor stations to the CGP-III, a pipeline system to return residue gas to the existing Tatweer reinjection header, tie in to existing pipelines and approximately 21 km long additional butane product pipeline from CGP-III to Sitra. 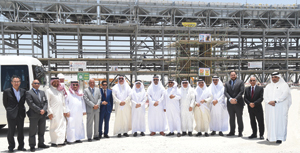 The scope also include modifications to the Sitra Storage facility to accommodate the additional production. This includes installation of two additional storage tanks, one 200,000 bbl for propane and one 100,000 bbl for butane, addition of a new propane compressor train, new flare, fire water pumps, control room, switch room, land reclamation to accommodate the new equipment being installed and associated instrument and electrical works. As of the year-end (2017), 100 per cent of engineering, 98 per cent of procurement and 68 per cent of construction activities have been completed where the overall project progress was 72 per cent against the planned 74 per cent. Commissioning is expected to commence in September 2018 in preparation to receive the product from CGP-III. Since the expansion is moving forward in anticipation of long-term supply of gas, what plans are in place to ensure adequate gas supplies? Currently 350 mmscfd of associated gas is re-injected into the reservoir without processing. Tatweer Petroleum forecasts indicate that this volume of gas will be available even after 2029. However, there will be a slight decline in the yield of LPG and naphtha over the lifetime of the project. Tatweer Petroleum will supply CGP-III with the required amount of associated gas through an Incremental Associated Gas Processing Agreement. What will be the biggest benefits from the expansion? The new CGP-III facility will recover high-value-added petroleum constituents (LPG and naphtha) contained in the petroleum-entrained gas which have not been recovered in the past. By exporting recovered petroleum constituents as commercial products, the project will contribute to the development of the oil and gas industry in Bahrain and generate additional revenue for the Government of Bahrain. The project also will increase employment opportunity in Bahrain by generating additional jobs. With the kingdom making sizeable efforts to boost production and increase recovery levels from the mature Bahrain filed for which further gas will be needed for reinjection, do you see gas imports starting even before the LNG terminal becomes operational by 2019? 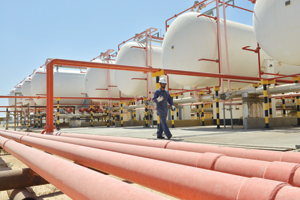 Development of Bahrain’s own gas resources goes side by side with LNG importing facilities. According to a forecast the associated gas supply to Bahrain National Gas will be available even after 2029. Therefore, the kingdom is not expected to import any gas for before commissioning of the LNG terminal scheduled for 2019. As you are aware, our business activity depends on the availability of associated gas as feed, even as Tatweer Petroleum with nogaholding are closely working together to ensure that gas injection continues in the oil field. What were some other new projects/contracts signed during the year? Please give details. • Awarded annual maintenance contract for 40KVA UPS. 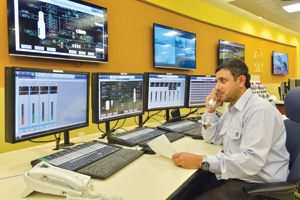 What is your gas production and consumption forecast for the next years for Bahrain? Fuel gas consumption by CGP-I/II will be about 35 mmscfd. Fuel gas consumption by CGP-III will be about 8.5 mmscfd. What is your take on the pricing of gas supplied to the industrial sector? Do you think there is need for price revision taking into consideration the current economic situation? In the GCC, the low gas prices, which are set considerably below international prices to encourage investment, have traditionally provided the region’s industrial sector a significant competitive advantage. Low prices allowed many LPG and petrochemicals companies to quickly capture a larger share of the global market, thus proving good financial returns to pay off capital investment. While abundant and cheap gas has played a critical role in the development and diversification of the economy, the current financial model is not sustainable as the cost of new gas production is continuously and significantly on the rise. According to market reports, gas production costs are in the increasing trends ($7.00 per thousand cubic feet by 2030). Therefore, in a move in the right direction, many countries across the region, and Bahrain is one of them, have taken major and decisive steps to increase gas prices. I believe such price increases are fair and a reasonably sound market strategy considering that gas prices should accurately reflect the cost of supply and value of the gas to consumers. I think there definitely should be a need for a price revision taking into consideration the current economic situation and therefore the need to adopt a gas pricing reform that should react to market fundamentals. However, the gas pricing structure should be carefully crafted through a mechanism that would place the GCC gas prices closer to its true value and somehow reflect the global and regional dynamics of supply and demand. Nonetheless, and as quoted by many gas pricing reviews, gas prices should follow a formula that is linked to either the crude oil index or an international/ local price gas hub. Either way, it will have adverse consequences on current and old consumers if not managed carefully. The formula should be flexible and targeted to capture the risk mitigation measures of gas prices increases versus product prices decline to ensure that the benefits of the new pricing model are accepted by all parties. What national, regional and international recognition has Banagas received during the last year? How does Banagas ensure quality in its operations? What have been your achievements in this regards? • 'Combined OHSAS 18001:2007 and ISO 14001: 2004 Re-Certification from Bureau Veritas Certification (BVC). Banagas follows all international standards in its operations and is benchmarked against international companies across its activities. In December, the Company Quality Management System was audited by BSI and recommended for continued ISO 9001 – 2015 certification. Based on ISO 9000 family of quality management systems standards, Banagas developed comprehensive Quality Policy and Quality Management Plan which is designed to help Banagas to ensure that they meet the needs of customers and other stakeholders while meeting statutory and regulatory requirements related to LPG production. – An ambitious project to retrofit existing gas starting motor powered by high pressure gas with high efficient electrical motor controlled by variable speed drive is being undertaken since 2017 to minimise venting of fuel gas during start-ups. In 2017, two retrofits completed and the remaining retrofits planned for completion by 2022. – A Lube Oil Mist Eliminator has been installed and successfully commissioned at Compressor Station – 6 to minimise oil vapour emissions to the atmosphere. • Replaced all Mercury Vapour type street & CCTV light are changed to LED type in CGP-I and CGP-II, as a part of energy conservation & environmental improvements. • Successfully organised Safety, Health, and Environment Week on the theme 'Health is Wealth'.